Please stay connected on Instagram @themedicine.show for updated event information. 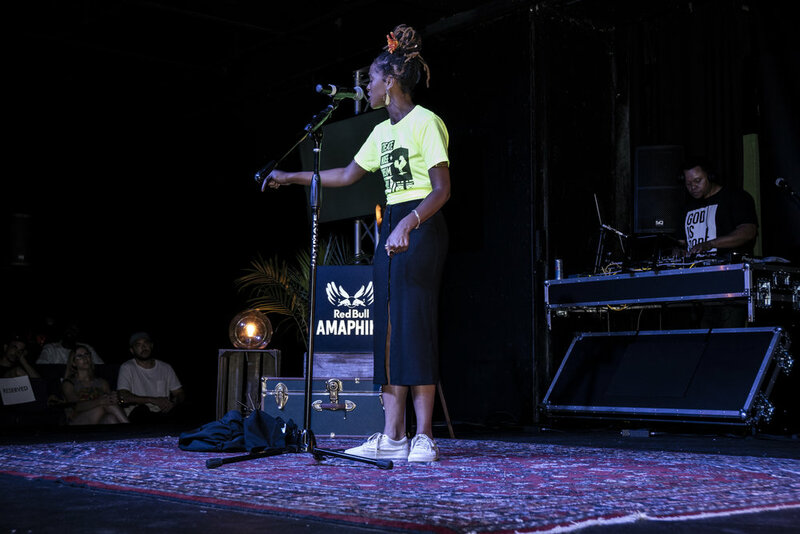 For the second year in a row, The Medicine Show partnered with the Red Bull Amaphiko Festival to bring a special night of storytelling to the city of Baltimore. The event again took place at Arena Players and saw some of the most talented storytellers in the city share the inspiring stories of 8 local social innovators. Thank you to all of the participants and audience who came out to share in this amazing night of storytelling for social change. 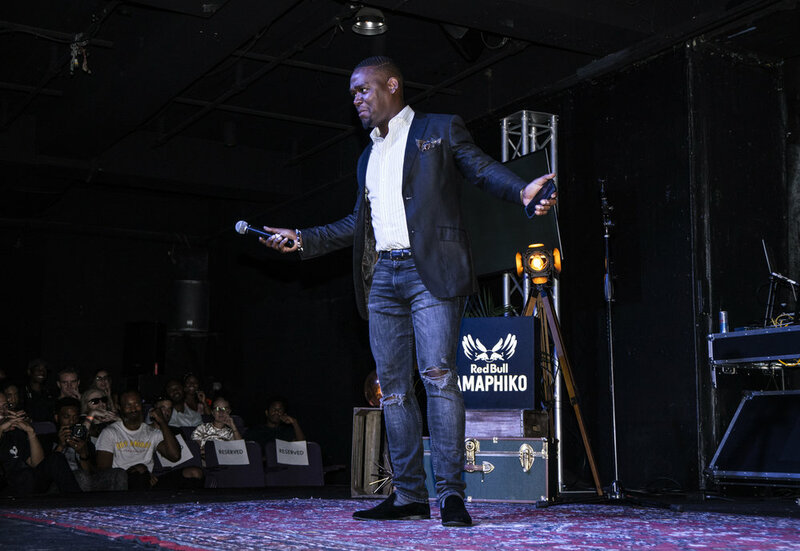 The Red Bull Amaphiko Medicine Show. 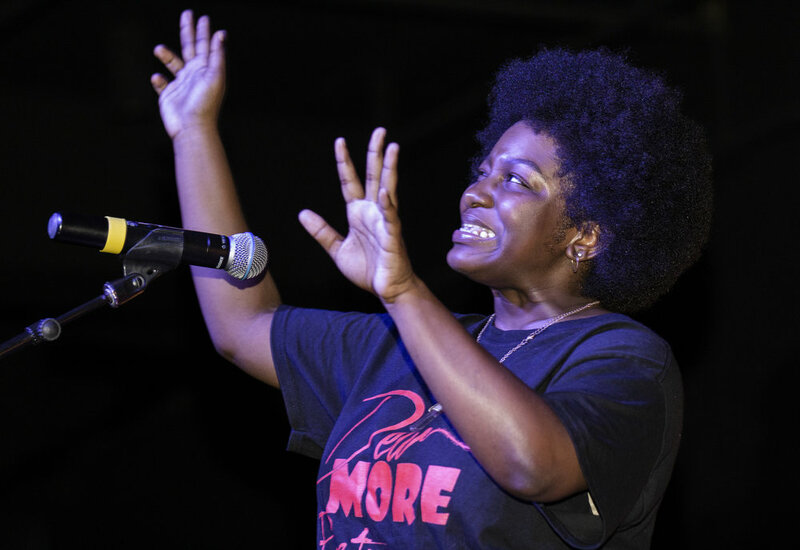 Nia June is a Baltimore native, spoken word artist, published poet, dancer, and English student at Towson University. 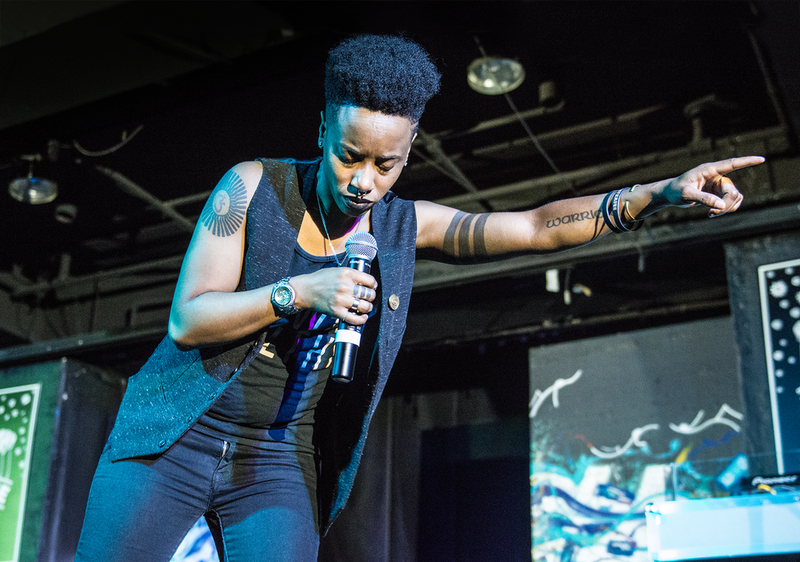 Nia has been the featured performer of several conferences, plays, and poetry productions in the DMV area. She is a teaching artist with Dew More Baltimore and Leaders of Tomorrow Youth Center. Nia is also a member of the Beta Chapter of Sensible Women Initiative. Her most recent work can be found in Grub Street Literary Magazine. Kondwani Fidel is an essayist and poet that has toured in the United Kingdom and lectured and taught classes at the University of East London. Fidel is the author of Raw Wounds and Hummingbirds in The Trenches. He is a M.F.A. Candidate at the University of Baltimore, concentrating on Creative Writing and Publishing Arts. He is from, and currently lives in, Baltimore, Maryland. David Fakunle, Ph.D. is a self-described “mercenary for change,” willing to employ any talent and occupy any space in efforts to elevate people of African descent and anyone who feels divested from their truest self. A graduate of the Johns Hopkins Bloomberg School of Public Health, David is the co-founder and CEO of DiscoverME/RecoverME, an organization that utilizes the African oral tradition to encourages the claiming of one’s narrative for personal and organizational growth. Joy Postell, a Baltimore-bred vocalist, wraps around her listeners with a voice so strong yet smooth it makes your soul feel shaken and held at the same time. Dynamic in her vision as well as her messages, Postell strikes a remarkable balance between soulful sensuality and fierce proclamation. And with her EP "Diaspora" slated to drop in August of 2018, her name is truly one to remember. Touring consistently nationally and internationally since 2014 in her band Chiffon, Baltimore native Amy Reid has performed in venues ranging from DIY spaces to museums. After releasing her first solo album "Hirsute" in 2017, Baltimore City Paper deemed it the Best Solo Debut album of the year recognizing her powerful melodies, unique textures and production. Reid is also the founder of GRL PWR, a collective based in Baltimore which currently focuses on a legendary drag show called SWEAT representing both drag queens and kings. 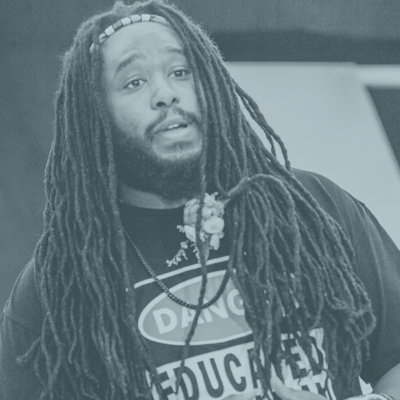 Eze Jackson is an Emcee, Journalist and activist. 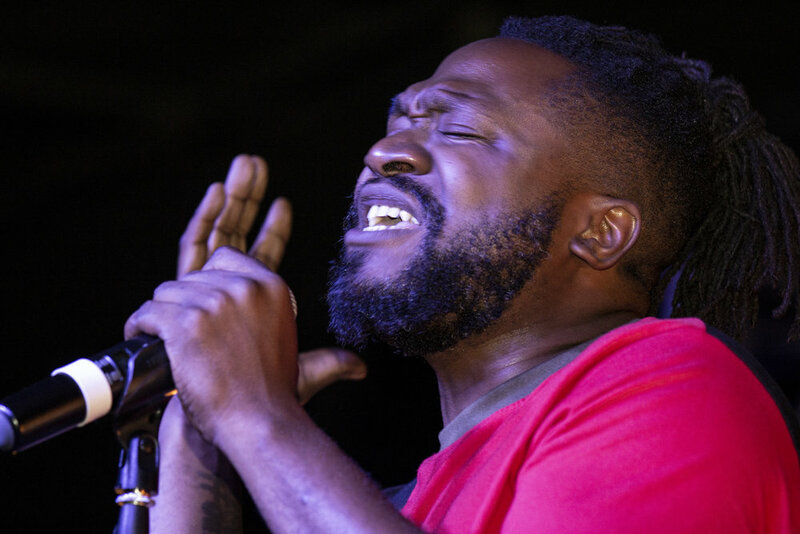 As the frontman of the band Soul Cannon as well as a solo artist, he brings high energy and forward thinking lyrics to almost any musical challenge. 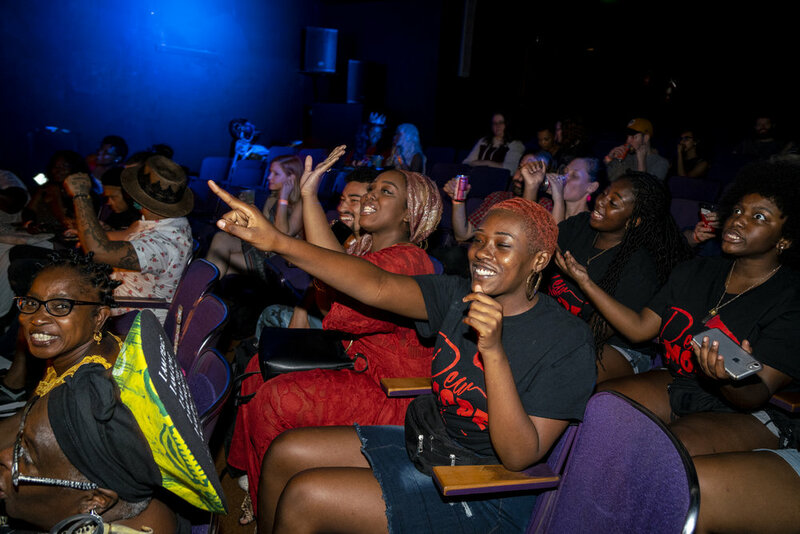 As a Host/Producer at The Real News Network, Eze often covers stories that effect Black Baltimore and it's arts and culture. He is also the host of Lineup Room's Bmore Beat Club and a frequent collaborator with the Baltimore Boom Bap Society. Hoesy Corona is an uncategorized artist working across media. Corona has shown compelling works and inventive sculptures fitted to the human body extensively at various institutional, private, public and underground venues including among others The Hirshhorn Museum and Sculpture Garden, The Baltimore Museum of Art, and Current Space. In addition to maintaining a prolific studio practice Corona is the founding co-director of Labbodies in Baltimore, MD. Recent honors include a Halcyon Arts Lab Fellowship; an Andy Warhol Foundation Grit Fund Grant; and a Ruby's Project Grant. Sir Alex the “Orator of Verbal Memoirs” is a 26 year old Baltimore native who has fell in love with the art of performing, more affectionately known for his comedic genius. Sir Alex is the curator and host of “Snaps & Laughs” a weekly poetic and comedic experience he has also curated and hosted several other events. You can catch Sir Alex on season 3 of Kevin Hart’s Hart of the city airing this fall on Comedy Central. 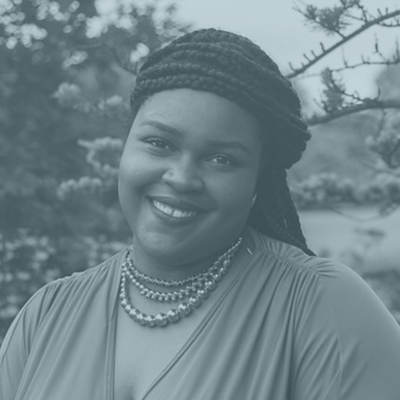 Brittany is a West Baltimore native and an engineer; she uses her experience from programming nuclear plants, and planning satellite explorations, to create B-360. 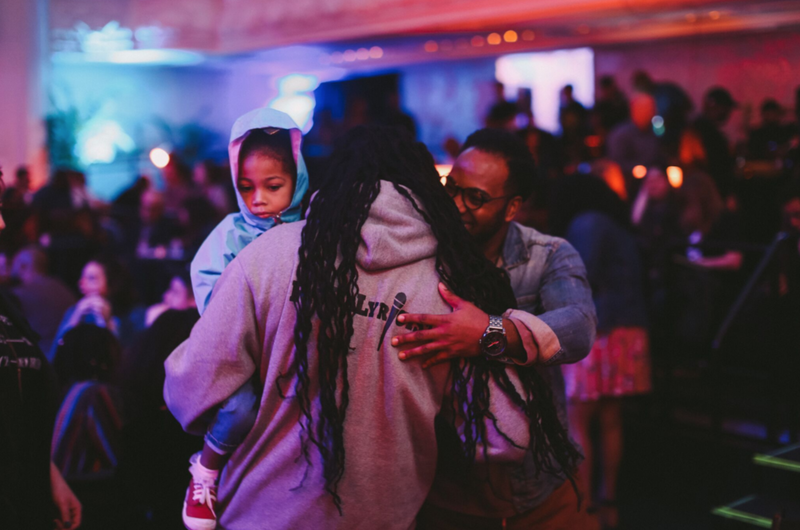 B-360 utilizes dirt bike culture to end the cycle of poverty, create pathways to STEM and change the narrative around engineers and dirt bike riders. The program has worked with 3000 students and counting, hired riders and wants to shift the culture forward by working with law enforcement, city officials and riders to unite communities. A winner of The Growing Green Competition, Tha Flower Factory is showing another side of urban agriculture by focusing on creating beautiful spaces with flowers and herbs. TFF is on a repurposed empty half acre lot located in the Broadway East neighborhood. Its mission is to grow high quality sustainable flowers and herbs, promote green entrepreneurship, be a steward for the environment and provide experience-based training to the community. 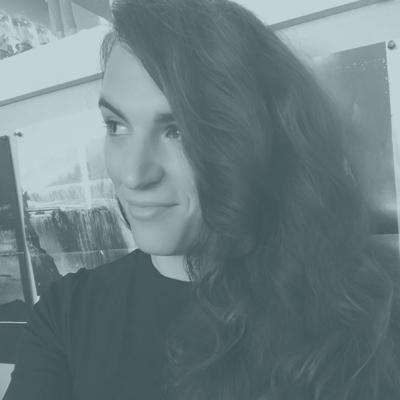 Ava Pipitone is a Co-founder of HostHome Benefit Corp., the Executive Director of the Baltimore Transgender Alliance, a worker-owner at Red Emma's Bookstore and Coffeehouse, and a diversity and inclusion consultant with Circles of Voices. 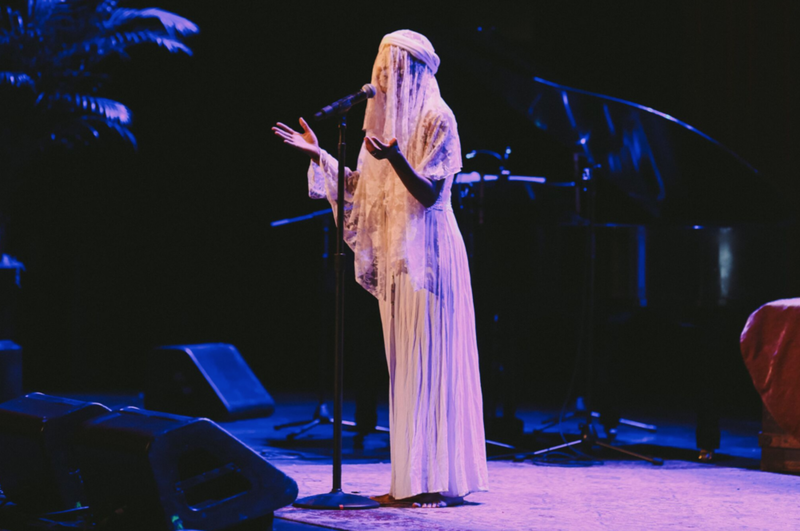 She invites authentic community healing through the spoken word and egalitarian spaces. Housing LGBT folx, building collective worker power, and healing the transgender community are the fruits of her labor. Noisy Tenants was founded by Nicholas Mitchel and Chris Landrum in 2012. 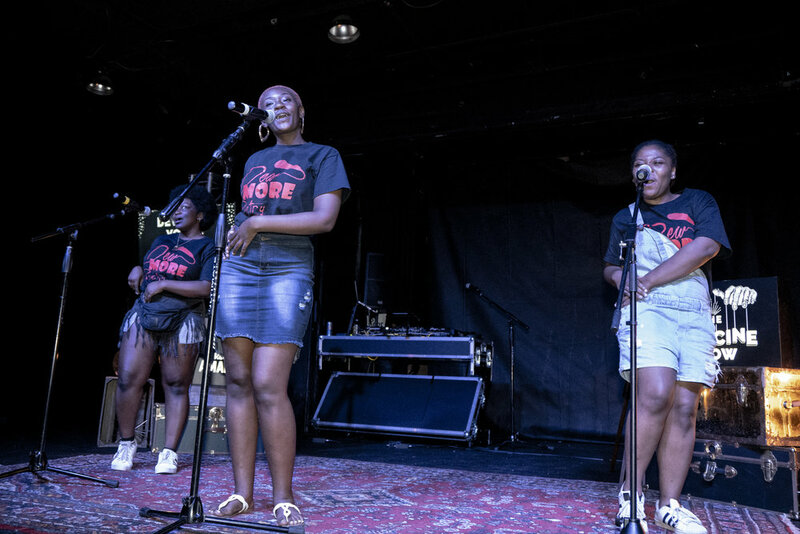 By cultivating innovative partnerships between companies/nonprofits and communities, Noisy Tenants takes on projects that communities care about and provide opportunities for authentic ownership. They are currently housed at the Greenmount West Community Center (GWCC) where they are working on a number of projects. Michael A. 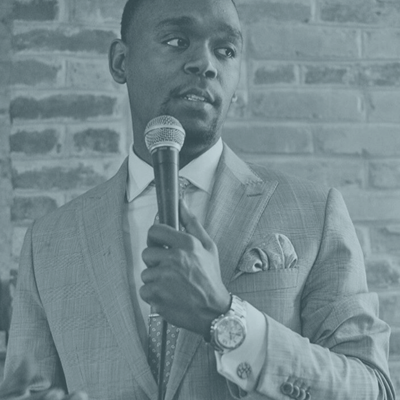 Battle Jr., the founder and Chief Executive Officer of RICH-Restoring Inner City Hope, Inc., is a mentor, motivational speaker and community advocate, known for his commitment to transforming Baltimore city. He is a leading voice of community engagement and empowerment in his city. Through his leadership and unification of community stakeholders; homicides and shootings have decreased in the Cherry Hill community. Mr. Battle’s mission is to simply be light in dark places. Liliane Makole, from Cameroon moved to Baltimore in 2013. She loves to cook and share stories behind her food. Her co-founders and her created Mera Kitchen Collective, a food-based cooperative, founded by and for refugee and immigrant women with a passion for cooking. Mera’s members are each Sunday at the Baltimore Farmers Market, hosting pop ups, cooking classes. Mera empowers its members through ownership to overcome structural barriers that limit opportunities for refugee. Kyle Pompey, owner of Nice Shot Media, LLC. considers himself an "organic photojournalist." Whether collaborating in his studio or documenting throughout his travels, Kyle avoids posed or planned pictures. Instead, he perceives the energy of his subject, which he allows to define the story of the moment. Inspiring imagination is the goal of Perspective: Baltimore. Designed to promote freethinking every image will deliver a different narrative from the reader. 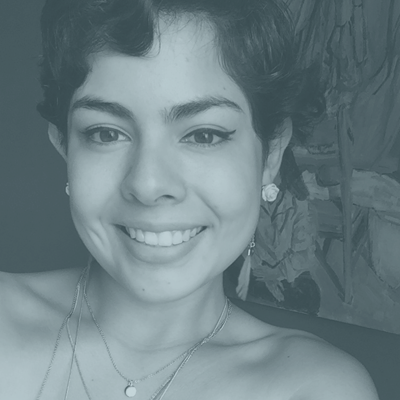 Valeria is a multi-disciplinary artist, designer, and innovator dedicated to addressing social justice issues through her work particularly around immigration, culture, food, and racial justice. She is the Founder of Roots & Raíces, which was created to provide immigrants and descendants of immigrants a platform to perform, celebrate, and highlight their contributions to the United States. She also founded Kinetic Kitchen, which is a mobile cooking program dedicated to providing cooking and nutrition education for kids in Baltimore. 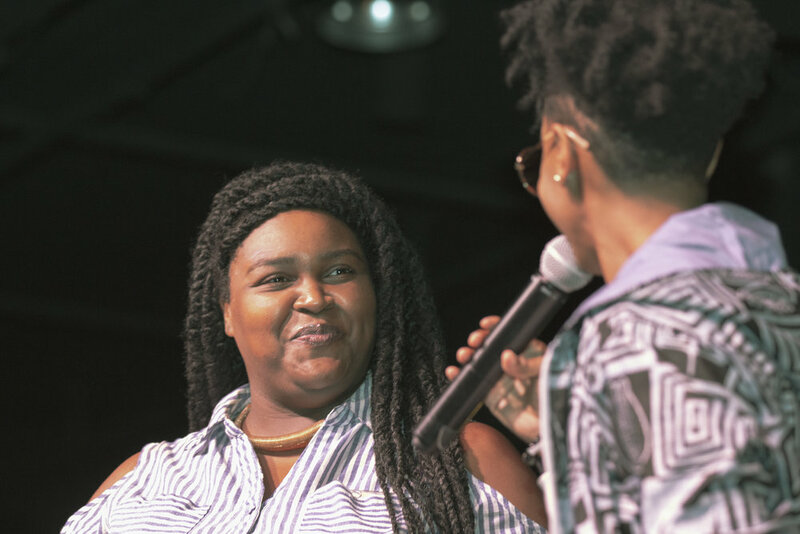 The Medicine Show was hosted for the first time in the Crescent City of New Orleans on December 5, 2017 in partnership with Red Bull Amaphiko and local social innovation incubator Propeller. The event took place at the Civic Theater and was hosted by LOVE the poet with Cool Nasty as the house musical guests. The level of talent and storytelling was definitely representative of the spirit and soul of New Orleans and was a timely reminder of the impactful work that is taking place in the city. Thank you to all of the artists, participants, and audience for joining us for a remarkable evening. 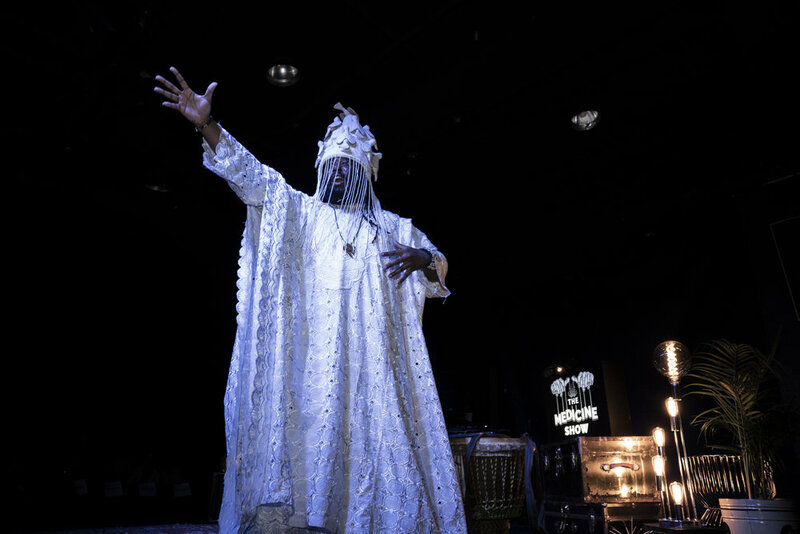 On the evening of August 17, 2017, The Medicine Show was hosted at Arena Players in Baltimore as part of the Red Bull Amaphiko Festival. 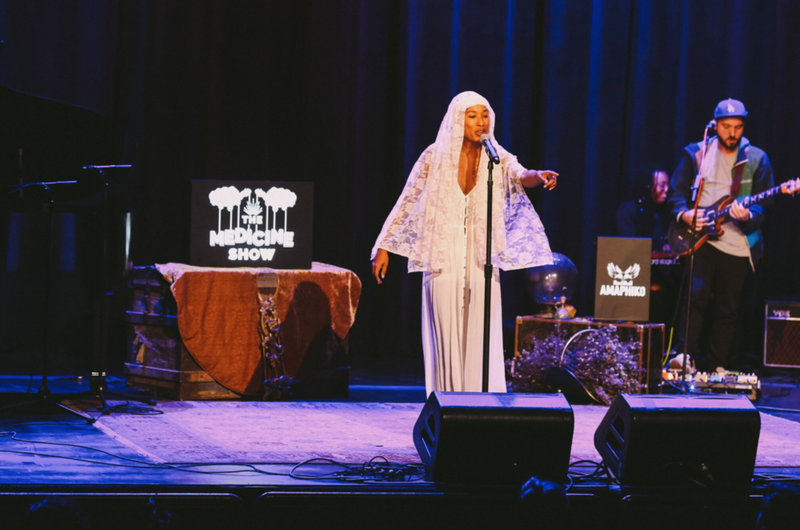 The show was co-hosted by Be Free Fridays and Invested Impact and saw seven local artists share the amazing stories of some of the social innovators making positive change in Baltimore city. 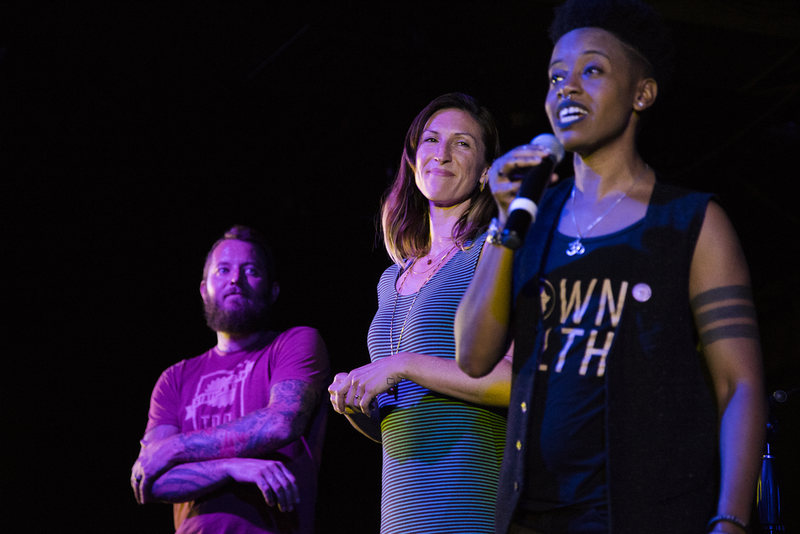 The epic night of storytelling took place in front of a capacity crowd of community supporters and set the bar for what collaboration between artists and entrepreneurs can look like.